From product illustration videos to extensive documentation of features in our knowledge base, you'll have everything at your disposal to get started with HappyFox. 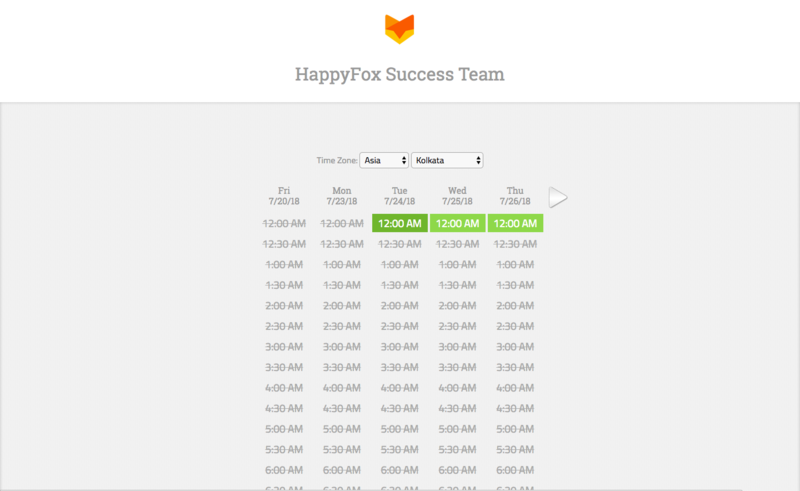 However, there might be instances where you have queries related to HappyFox that requires personal assistance. A bookable one-on-one session with our customer success manager - best suited for detailed Q&A and product workflow discussions. A live chat with one of our customer success representative - best suited to address small issues quickly. Q&A session support is available for to enterprise plus plan customers. However, it is available for all accounts during the trial period. Only Account Administrators will be able to schedule Q&A sessions. Click on the Support icon in the top bar. In the subsequent drop-down click on "Book a session". You'll be redirected to a booking page where you can book a 30-minute slot. Fill in your contact details to confirm your booking. You'll receive an email containing the event-related information. Live chat support is available for all plans and to all agents. In the subsequent drop-down select "Chat with us". A new chat would popover on the bottom right. Attach relevant files, ask your helpdesk-related queries and get them clarified with our customer success representative via chat!